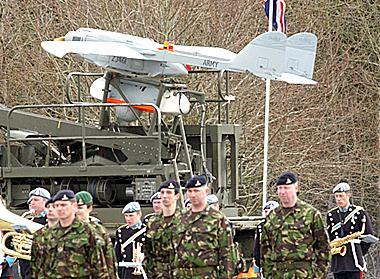 The UK Ministry of Defence (MoD) has announced the formal retirement of its infamous "Phoenix" reconnaissance drone, leaving at least a two-year wait before its partly-British replacement is planned to come into service. Until then, the British forces will use hastily-imported overseas equipment bought under emergency procedures. "We had many years of great operational experience with Phoenix and it has served us really well," said Lt Col Nick McRobb, commanding officer of the British Army's drone-aircraft regiment, quoted by the MoD press office. Psst - George! Why aren't we having a flypast, then? Colonel McRobb's assessment of the Phoenix is rather at odds with that of other soldiers, who nicknamed the unfortunate machine the "bugger-off" drone for its tendency not to return from missions. Its troubled 1990s development history is now used as a how-not-to-do-it example in university systems engineering courses. The Phoenix was especially renowned for its Rube Goldberg/Heath Robinson recovery method, in which it descended to land hanging upside down beneath a parachute. This was in order to safeguard sensitive sensor gear in a belly pod. Unfortunately, the upside-down landings were found to wreck the fuselage, so exasperated engineers finally added a dorsal airbag to cushion the shock. Unsurprisingly, the Phoenix suffered a fearful attrition rate when it finally went operational in 1999. More than 70 aircraft went missing, were shot down or got written off in crashes in Iraq alone between 2003 and 2006, and more were lost or wrecked in the Balkans before that. Still others have had to be cannibalised for spares, and all this within a total fleet of only 198. It seems likely that last week's out-of-service parade, in which surviving Phoenixes moved past assembled troops on their launcher lorries, may have featured most of the visually intact Phoenix airframes still in existence. One can't help noticing that there apparently wasn't any flypast, either, which is quite usual when military aircraft go out of service - so in fact there may not be any serviceable Phoenixes left at all. It's difficult, then, to go along with Col McRobb and agree that the Phoenix gave "great operational experience". Some might also quibble with his assertion that it was in service for "many years", as in fact the MoD says that the final operational flight took place nearly two years ago in Iraq - meaning that the Phoenix served for just seven years, during which a fleet almost 200 strong effectively wiped itself out. Each "bugger-off" reportedly cost the taxpayers no less than £1.5m. Now Col McRobb's regiment will operate with a mixture of imported kit hastily purchased under "urgent operational requirement" rules - Hermes 450s imported from Israel, and miniature battery powered hand-launched "Desert Hawk" jobs from the States. The RAF has also purchased three bigger, more capable Predator-B/Reaper drones from the US, but plans to get more are rumoured to be on hold. All this gear is effective and comparatively cheap, and there is absolutely no doubt that the hard-pressed UK forces urgently need more of it. Ideally they would just buy more, relatively cheaply from existing suppliers. Unfortunately, MoD cash is normally required to do more than just buy equipment for men and women fighting and dying at the government's orders. It is also expected to provide jobs and votes here in the UK. Thus, the £800m drone budget will now be spent entirely on the Watchkeeper project, in which UK factories will be set up to produce a Hermes 450-type airframe copied from Israel and integrate French firm Thales' radar onto it. The resulting Watchkeeper aircraft will be a bit better than the current Hermes 450s - but they will cost much the same as much bigger, hugely more capable Reapers. And they won't arrive until at least 2010. And they will be dependent on parts and support from both Israel and France, so they don't offer Blighty an independent capability. Sure, deals of this type generate jobs in the UK. But it almost always turns out that each job costs the taxpayer (at least) a million pounds over and above the cost of buying existing gear - and then, in ten years' time or less, a similar demand is made in order to preserve the said job. The jobs actually turn out to be, in effect, a tremendously expensive dole scheme.